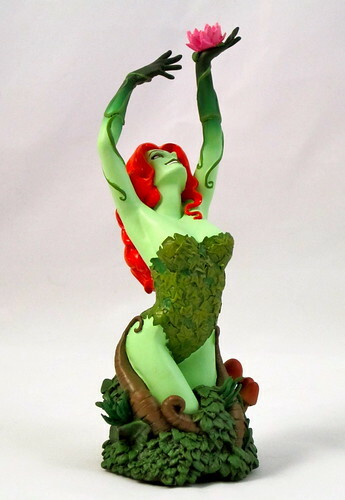 Last month I had a look at DC Direct’s full sized Poison Ivy effort, but that’s not the only statue attention the Foilage Fiend-ess has had this year (you have no idea how long it took me to come up with that alliteration!). 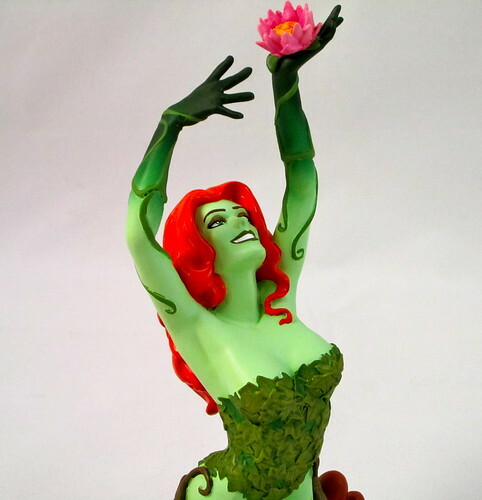 This time around, I’m looking at the DC Direct Women of the DC Universe Poison Ivy Mini-Bust . I mentioned in my review of the Cover Girls Poison Ivy that I’ve never been all that fond of Ivy’s modern age green-skinned look. I am, however, quite a fan of Amanda Conner’s art, on which the current series of these mini-busts are based. I don’t know that I’d buy a full-sized green-skinned version, but to keep the Conner Mini-Bust series complete, I decided to pre-order this. As it happens, this little bust has turned out to be a pleasant surprise! Conner has a very particular and recognisable style which has lent itself very well to this statue series, and Conner’s take on Poison Ivy is excellent all around and a great addition to the line. What I really like about this mini-bust is that Conner has focused on the character’s beauty rather than her villainy. We know Poison Ivy is a baddie, so we don’t need it in neon lights in this piece. Instead, we see Ivy reveling in the use of her powers, atop a base of foliage which includes a couple of rather questioning looking mushrooms. Jim Maddox has done an excellent job on the sculpt of this mini-bust. There is a great deal of detail in this piece, and everything from the leaf details on Ivy’s bodice to the foliage in her base to the waterlily she is holding to the sky, it’s all beautiful. I’ve long been a fan of Maddox’s work for DCD, Bowen and elsewhere, and his sculpting here certainly does not disappoint. Unlike the Cover Girls Poison Ivy statue, which had some paint issues, this piece is spotless. 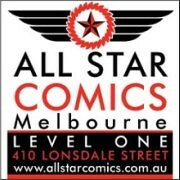 The colours are well chosen, and compliment the slightly cartoon-ish edge to Conner’s design. The bright orange of her hair is a great contrast to the pale green of her skin, and the darker greens used to highlight her facial features really makes them stand out. This isn’t a statue that can be posed at any level of a display as Ivy is looking upwards at quite an angle. I have most of my Women of the DCU Mini-Busts on a higher shelf in my display, but at that level I couldn’t see Ivy’s face at all, so I have her on a lower shelf. This isn’t really a complaint, as in many ways it’s the pose that makes the statue, but something to note for potential purchasers. All up, for a piece I ordered purely to keep a line complete, I am surprised by how much I ended up liking a green-skinned Poison Ivy in mini-bust form. Well done to DC Direct, Amanda Conner and Jim Maddox for making it so! I've always been a bit wary of the Green Ivy idea. The fact that she's turning into a plant takes away the edge of her insanity. If she's part plant, then it makes sense for her to be militant on behalf of plants as opposed to someone who is psychotic and obsessed with plants. this one screams Disney to me. she looks like a twisted stepmother-witch character which isn't all bad... just not the way i envision Ivy.